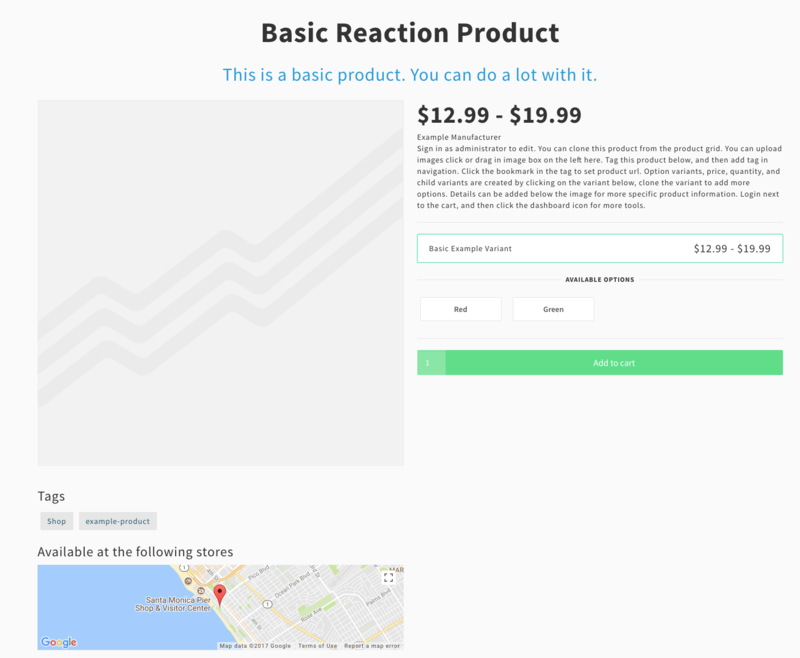 ⚠️ Note: This guide has been deprecated as the release of Reaction 2.0. The latest guide on how to customize the product detail page can be found here and the guide on how to extend a schema can be found here. Before you get started with this tutorial, make sure to complete the Plugin Tutorial and are familiar with basic React. This tutorial continues on from the beesknees plugin. In this tutorial, we're going to save latitude and longitude fields for each product and use that data to display a map on each Product Detail Page (PDP). Because our products should be geotagged, we need to extend each product with two new fields for latitude and longitude. We'd like to keep all existing product properties from the original schema called Product intact. This is why we import the original schema and use it as base schema for the new, extended schema called ExtendedSchema. After extending, we make sure that our new schema is attached to the Products collection with Products.attachSchema(). The important thing about the Products collection is, that its documents don't share the same schema. There are so-called simple products and product variants. We're going to modify the simple product type, which happens to be an ancestor for variant types as well, so regardless of the flavor of our product, all variants will feature the geo-tagging with lat and lon fields. Notice that the update operation to add latitude and longitude to the product needs to know which schema is going to be validated. This is done through parameter selector. Additionally we need to pass publish: true to ensure the internal RevisionAPI allows modification of the document. Now that we know where our products are located, let's enhance the existing layout of the product detail page (PDP) to display the coordinates in a Google map. ProductDetailPageSimpleLayout allows us to define how the PDP should look like in a declarative way. You may have a look into it here. After we've changed the generic structure and specified that we'd want to render a React component called AvailabilityMap rather than the original ProductMetadata, we need to re-register the changed layout definition with the original name productDetailSimple. The next step is to create a new React component which is going to render the Google map. Now having that at hand through Meteor.settings variable, we now need to think about how we can pass that as property into the component. Just using it within the React component itself is not ideal, because for one thing the React component should be self-contained with no external dependencies. This ensures that we can use the component in an environment-agnostic way (be it React Native or the server). And the second thing to know is that Meteor.settings is a reactive data source which may not be synced to client yet, when the component is going to be rendered. This is a very common scenario and luckily our friend called composer jumps in. The composer is a higher-order function that has no other intend as to feed in data into our React components. Let's build one! Notice that we put our reactive data sources within the composer function and wait for them to be ready (populated by the Meteor framework). Here we have two reactive data sources: the dependency on translation resources and Meteor.settings. Additionally we're going to register our container (read: data-aware component wrapper) as the ready-to-use Reaction Commerce component called AvailabilityMap. This is the identifier that connects to the earlier seen child.component in function changeProductDetailPageLayout.